Features: impressive handling and response thanks to the enhanced profile. - Mileage and regular wear thanks to the Diablo like pattern design. 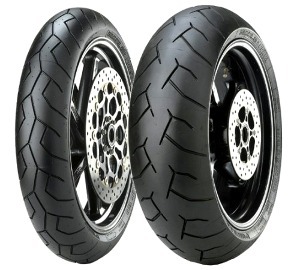 - Exceptional wet and dry grip thanks to the moto derived compound. A good value tyre with a good balance of performance and wear. Not a common tyre size on this bike so I had a limited choice as to what would fit. A friend reccomended these as they were a good price for what you get. Very impressed with the dry running and cornering feels very stable at all lean angles. Not amazing in the wet when it comes to a slippery roundabout. But the front brake struggles to lock the front the under braking even in the wet. Buy for a sports tyre they do alright if you keep it smooth. I have risen 6000 miles so far and they've barely squared off, as opposed to my bt016 last year. All round good buy for the money. And next time I may upgrade to the corsa's if I can find the money!